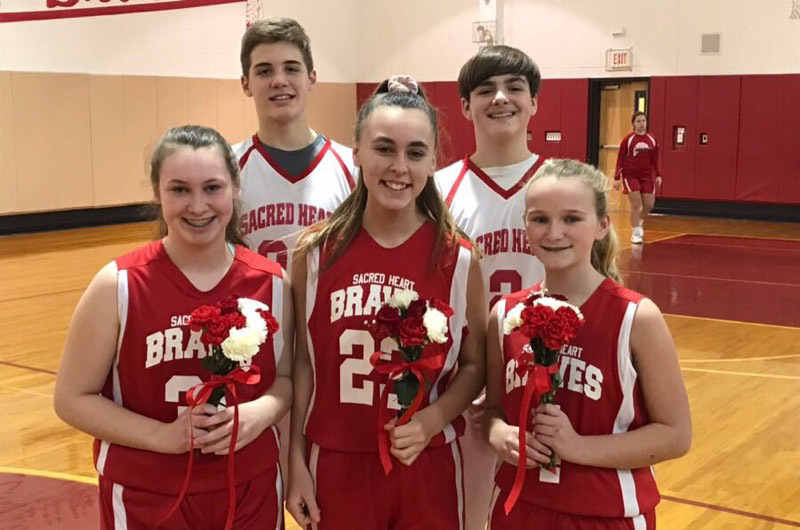 It’s a rite of passage in Royersford: each year, the coaches and teammates of Sacred Heart Parish’s CYO basketball team honor the eighth grade players with posters and flowers. Both seventh- and eighth-grade students from the parish play on the team. As part of the annual event, the younger teammates make a personalized poster, highlighting the name and jersey number, for each player. During a brief ceremony held at center court, parents are thanked for supporting their young athletes. Players are recognized for their commitment, sportsmanship, and physical development. Students in fourth grade and up are eligible to participate in Sacred Heart Parish’s CYO basketball program. After graduating eight grade, parish youth can continue to play CYO basketball through high school.